On a gut aesthetic level, I didn’t like the direction I was headed (though, if you like any of these names, go ahead and use them). None of them seemed to trip off the tongue, and they all reminded me a bit of the buzzword Edu-tainment, which is a big turn off. It seemed like I was flying blind - I needed a plan. 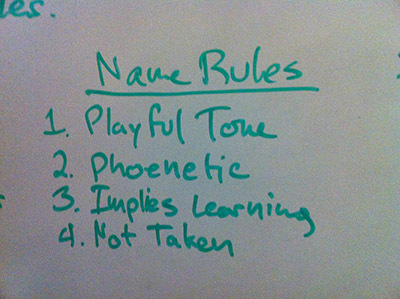 So, I came up with a set of criteria for determining whether something was a good name for my nascent studio. This is a lot less important because the actual twitter handle and associated username need not be the same, but still might cause confusion - at least until the studio is influential enough that it gets verified by twitter. EDIT: A great tool just game out for checking name availability and trying out some variations. Check it out here.